#Homes4AllMN advocates engage statewide with 5 in-district events! In early April, Homes for All MN supporters Rochester Area Habitat, Grace House of Itasca County, CommonBond Communities, Health in All Policies, and Joint Religious Legislative Coalition hosted in-district events to show legislators the impact of investments in affordable housing, strengthen relationships between legislators and community members, and urge legislators to support the Homes for All MN agenda. Read on to see the impact of these crucial events! Help get us to $130M in #Bonds4Housing in the final days of session! The legislative session ends in less than three weeks! 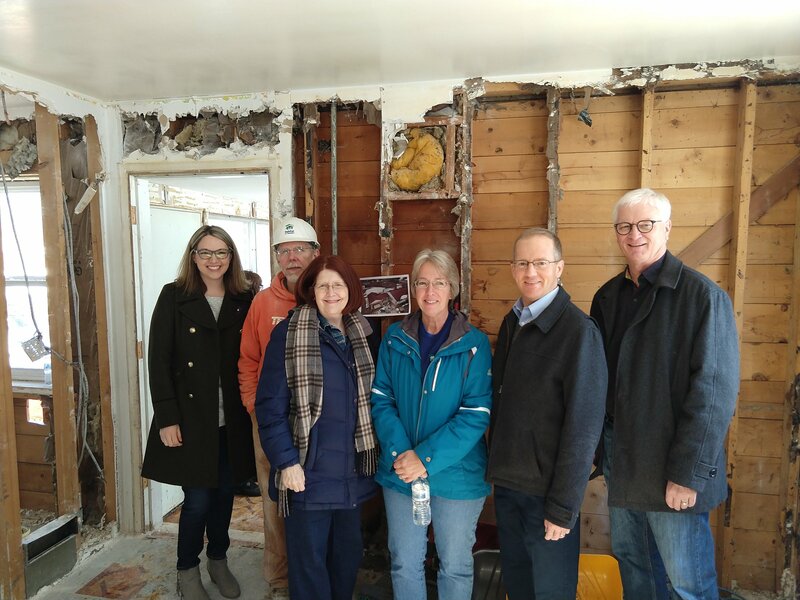 Conversations surrounding the State’s bonding package are increasing, and we want to make sure that lawmakers are hearing community support for housing. This week’s 5 for 5 is targeting key members of the Senate Capital Investment Committee. These members play an important role in finalizing the bonding bill. If you live or work in their districts, call and request their support for the Homes for All bonding request! JOIN US May 8 for an Our Homes, Our Voices Bonding Rally! Every day, thousands of Minnesota families are homeless or making dangerous sacrifices to simply pay their rent or mortgage. 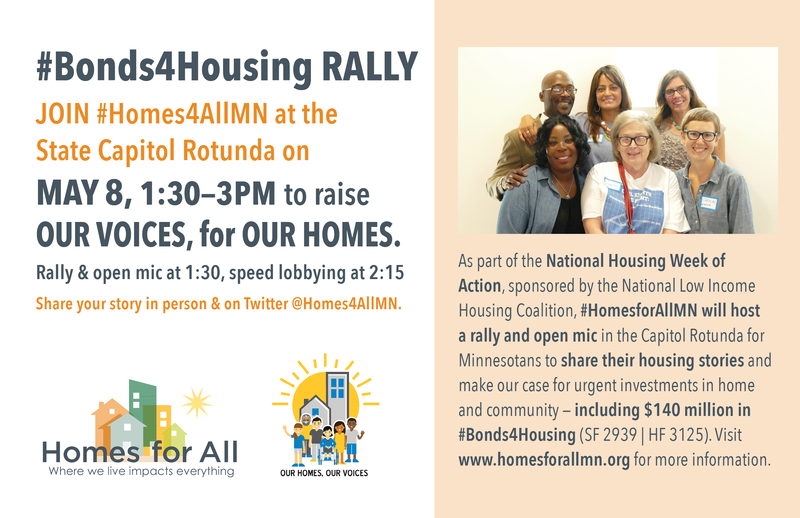 On May 8, join #Homes4AllMN at the State Capitol to raise OUR voices for OUR homes. Click here to download the above invitation to share with your networks! Speak up for #Bonds4Housing and #HousingTaxCredit today! The end of session is one month away, and it's a critical time to make your voice heard to secure needed resources for affordable housing: #Bonds4Housing and the #HousingTaxCredit. 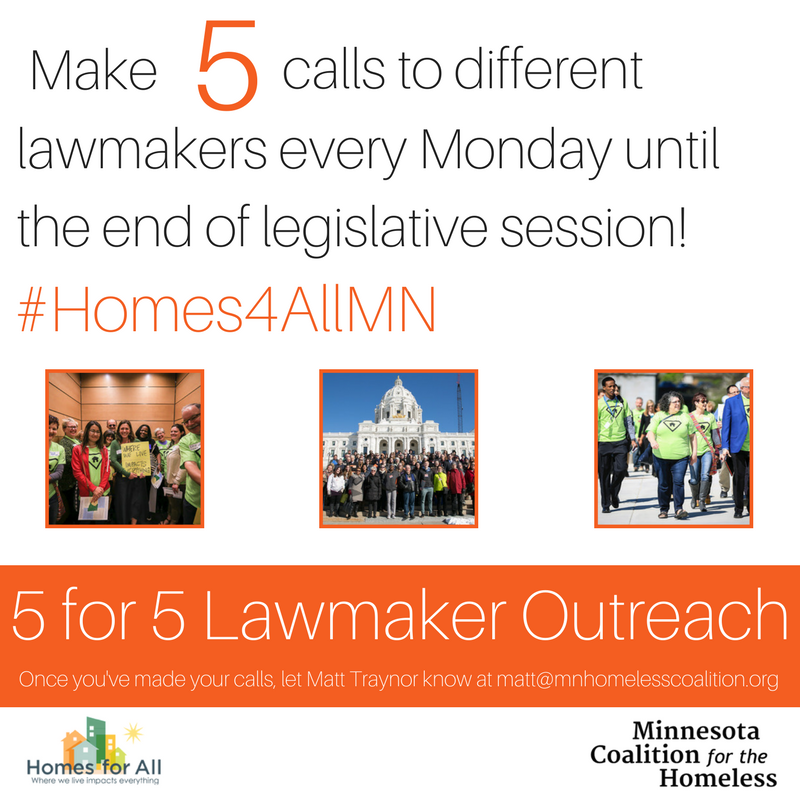 Here's two simple ways you can engage to advance #Homes4AllMN! Endorse the 2019-2020 Homes for All Agenda!